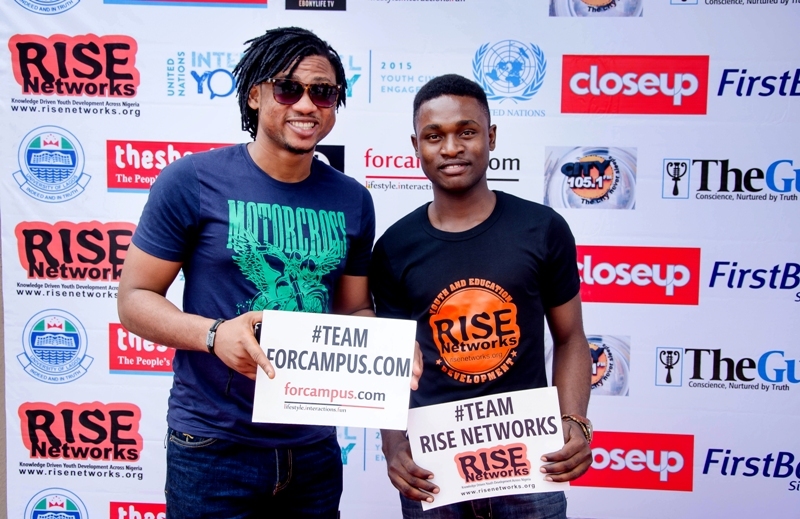 As far as Youth Programs go in Nigeria, it rarely gets better than a Rise Networks’ event. Weeks and weeks of planning and on ground publicity leads to the massive crowds that attend their programmes in every state they go to. 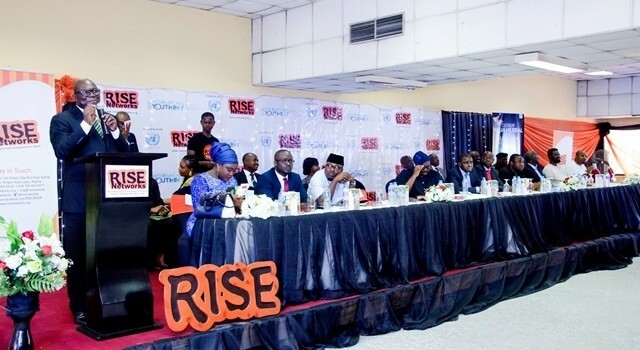 The UN International Youth Day 2015 commemoration was not an exception as before the event started thousands of students and young activists and professionals had filled the hall while others were just at the outside on the red carpet or visiting the stands of various corporate sponsors like First Bank and Close-Up. 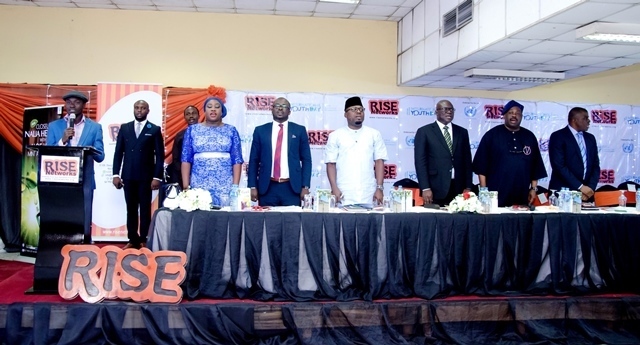 In line with Rise networks’ focus on Youth and Education Development via Capacity Building on Youth Inclusion, this year’s programme was to be the first big youth gathering after the 2015 elections that had brought on a change of government. 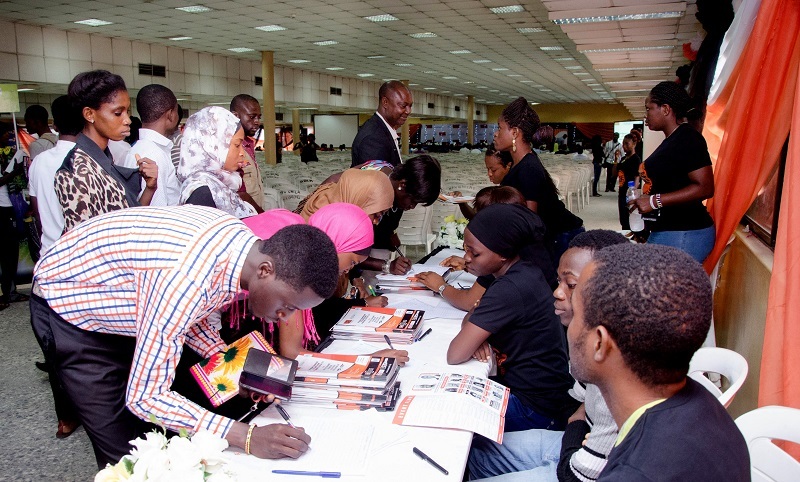 Participants registering at the venue of the #IYD2015NG event. 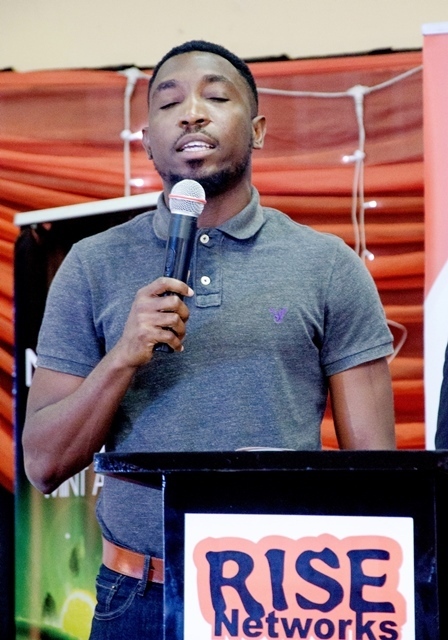 Timi Dakolo opened the event with a rendition of the national anthem while the UNILAG SUG President, Comrade Martins Abiodun followed up with the second stanza of the national anthem which is more like a prayer for the youth. Following swiftly was a fiery debate between Miss. Rinsola Abiola, a young member of the APC board of trustees & Anthony Ehilebo from a PDP affiliated Youth Group (Rethink Nigeria). The debate was moderated by this writer (Ademola Olarewaju) and one could feel from the high interest in the debate that the last elections have surely increased the political consciousness of usually non-partisan youths. 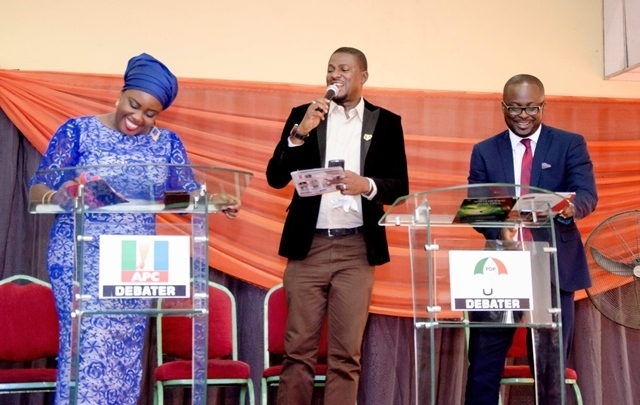 For many, the two session debate was the highlight of the event – an exuberant APC advocate Rinsola versus a PDP defender Anthony who struggled to sustain interest in his party even as more people hailed the APC representative’s arguments than his. Rinsola proposed and most speakers after agreed that the “If we can vote at 18, we can also be voted for at 18”. Award-winning singer/song writer, Timi Dakolo taking the National Anthem. UNILAG Students’ Union Government, President, Comrade Martins Abiodun taking the second stanza of the national anthem which is more like a prayer for the youth. L-R: Rinsola Abiola, Acting President, APC Young Women’s Forum and Member, APC Board of Trustees; moderator of debate, Demola Olarewaju; and representative of PDP and Volunteer Secretary, RETHINK Nigeria, Anthony Ehilebo. With a formidable line-up of speakers that included the Senate President Dr. Bukola Saraki who had to jet out last minute to represent Nigeria at the Inter-Parliamentary Union in New York, he was represented by his Deputy Chief of Staff in the person of Hon. Gbenga Makanjuola, the former lagos Governor Fashola, senior spokesman to the former President Dr. Reuben Abati, Ovation publisher Dele Momodu among others, the crowd was ready to be charged. Representative of the Senate President, Dr. Bukola Saraki, Hon. 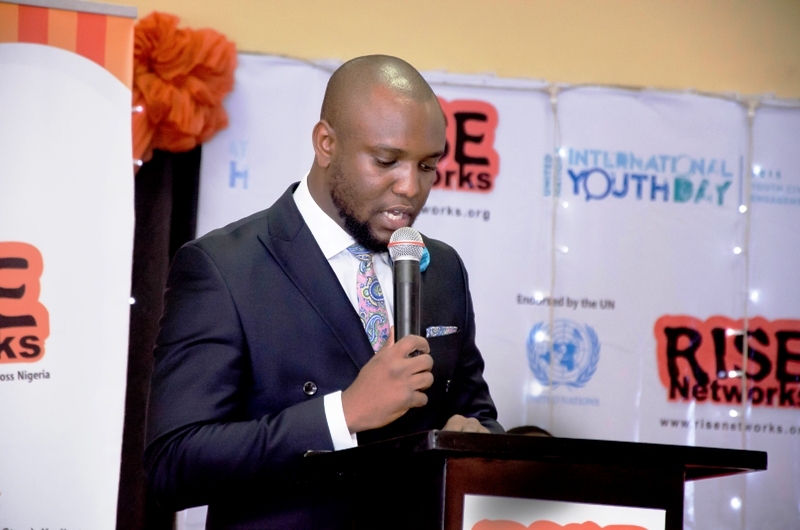 Gbenga Makanjuola at the #IYD2015 event. Former Governor of Lagos state, Barr. 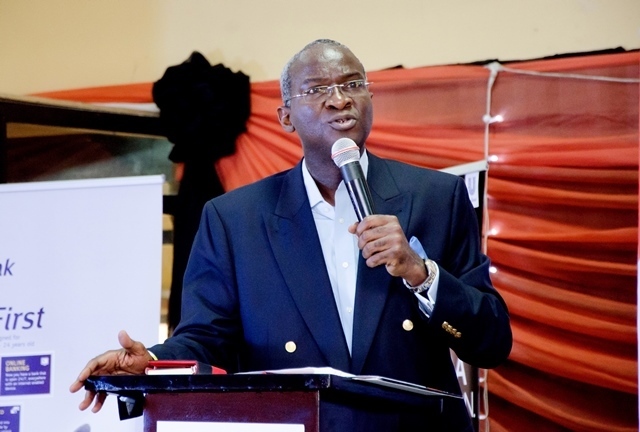 Babatunde Fashola (SAN) delivering his keynote address at the #IYD2015NG event. Dele Momodu opened with stressing the importance of political participation, explaining how he had in times past supported others into office until he decided to throw his hat into the ring and contest for the position of President. He insisted “the youths of today must go back to the days when young people had a strong voice” and emphasised that social media would be the force that would make youths in Nigeria a potent force in the polity henceforth. Event Compere, Seun Olaniyan, taking questions from students for Publisher/CEO Ovation Magazine, Chief Dele Momodu after his speech at the #IYD2015NG event. Senate President Saraki emphasised the importance of getting involved, saying “take part to take charge”. More importantly, he mentioned that the 8th Senate is going to come up with E-Parliament, a system where online voices can contribute to senate debates, make their voices known by engaging with senators and monitor events at the upper chamber of the National Assembly. One of the guest speakers, Dr. Reuben Abati, SA on Media & Publicity to Former President Jonathan, delivering his speech at the RISE Networks #IYD2015NG event. 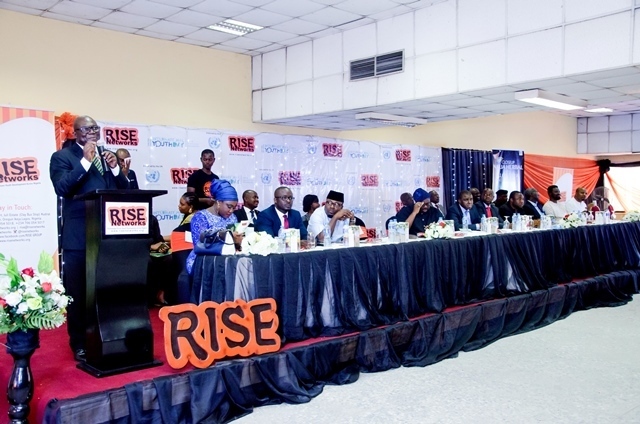 Cross Section of the Audience at the RISE Networks #IYD2015NG event. 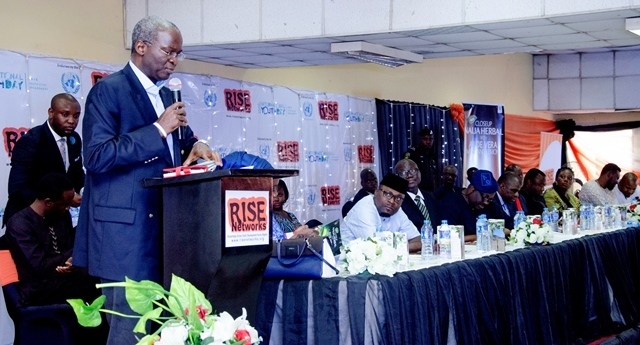 Dr. Abati spoke on the need for youths to develop a sense of identity – to mark themselves out from previous generations in rigorous thinking, distinctive engagement and an insistence on doing the right thing. He traced the role of youths in various change of governments across the world via ‘Arab Springs’ and also likened it to #OccupyNigeria but pointed out that the latter had a political undertone. He cited this as example of how governments that ignore the youths usually get swept off. Man of the moment, Ex Gov Fashola took the crowd on a practical journey in political rising by explaining that even though he feels young at heart and still plays football, he is by no standard a youth and has no right to claim being a youth. He aligned with Rinsola Abiola’s position that the minimum age at which people can contest for public office should be constitutionally reviewed then explained that when youths leave a vacuum in the political process, people who are above 50 move into such positions at the expense of youths. Former Governor of Lagos state, Barr. Babatunde Fashola (SAN) engaging the audience at the #IYD2015NG event. 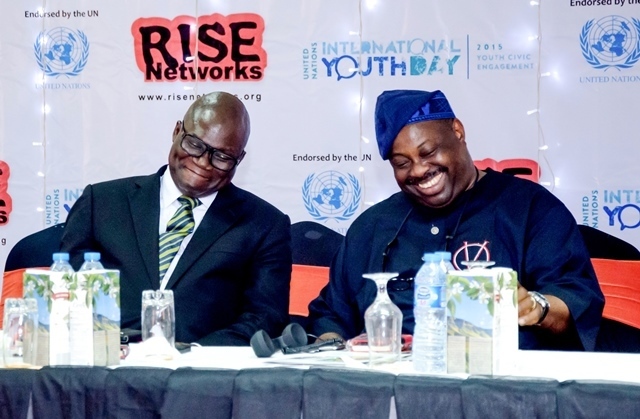 SA on Media & Publicity to Former President Jonathan, Dr. Reuben Abati and Chief Dele Momodu, Publisher/CEO Ovation Magazine sharing a moment at the RISE Networks #IYD2015NG event. Former Governor of Lagos state, Barr. 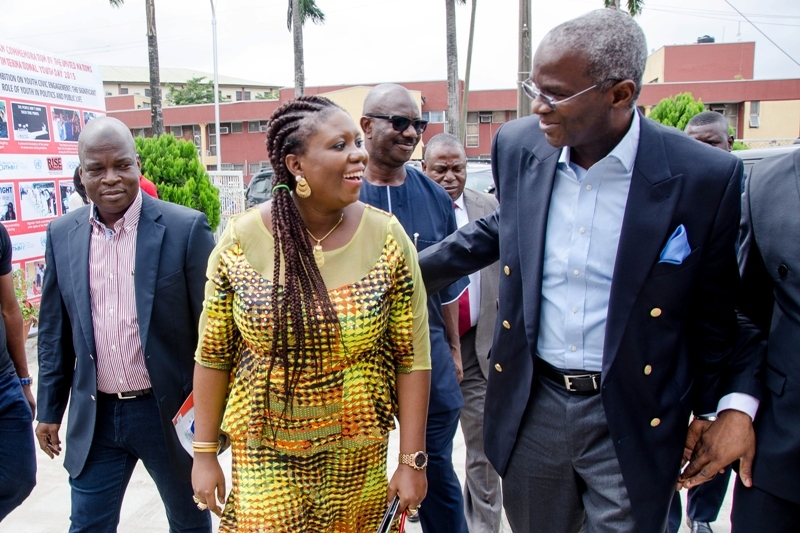 Babatunde Raji Fashola (SAN) with host of the event, Mrs. Toyosi Akerele-Ogunsiji, Founder/CEO Rise Networks. 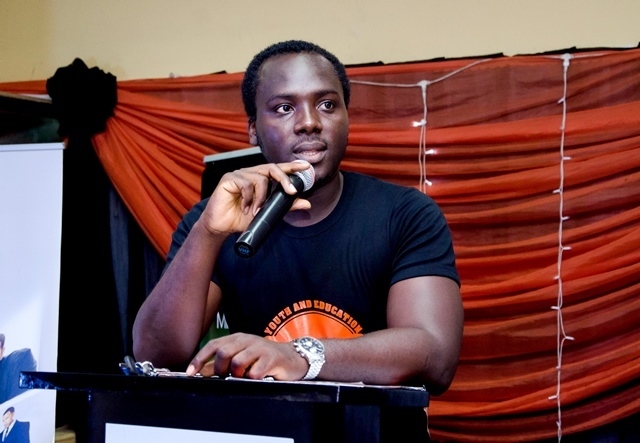 Award-winning journalist Tolu Ogunlesi took charge of the panel session where another invited guest Moses Siasia, a young contestant for the office of Governor of Bayelsa declared that Job Creation and Education were two key parts of his plan for youths in Bayelsa. The role of social media was discussed more in-depth as Abati explained that sometimes the abusive language employed by some made social media a tedious ground while Dele Momodu also toed the same line that social media had more positives for youths than negatives. FROM L – R: Special Adviser on Media and Publicity to former President Goodluck Jonathan, Dr. Reuben Abati; Renowned Journalist & Public Commentator, Tolu Ogunlesi (Panel Moderator), representative of Senate President Sen. Bukola Saraki, Hon. Gbenga Makanjuola; immediate past governor of Lagos state, Barr. 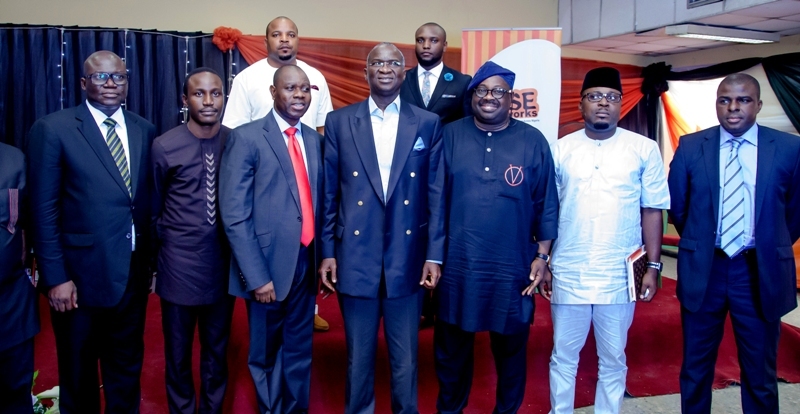 Babatunde Fashola (SAN); Publisher/CEO Ovation Magazine, Chief Dele Momodu; Nigerian Young Professionals’ Forum (NYPF), Moses Siasia and Representative of MD/CEO Ebony Life TV’s Mo Abudu, Mr. Uzoma Onwuchekwa. Standing Behind: Representative of Abia State Government, Sam Hart – Senior Special Assistant to the Abia State Governor on Public Communications and the compere, Seun Olaniyan at the event. 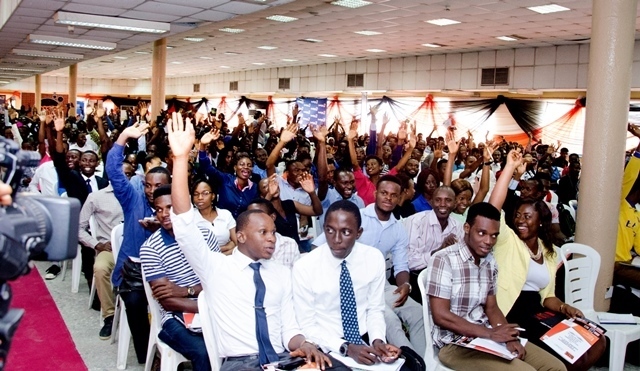 A cross-section of the audience raising their hands in response to Rinsola Abiola’s question of people experiencing an improvement in power supply under the APC led Federal Government. 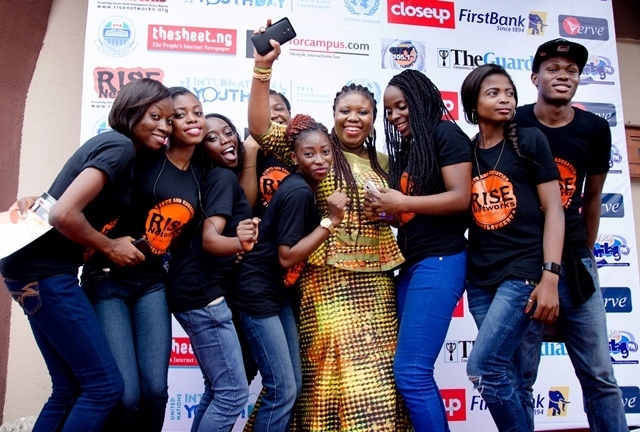 Mrs. Toyosi Akerele-Ogunsiji, Founder/CEO Rise Networks with a team of Volunteers at the #IYD2015NG event. Compere at the event, Seun Olaniyan, Radio Host, Nigeria Info FM. The event ended on a high note with all the attendees who came having picked up a thing or two. 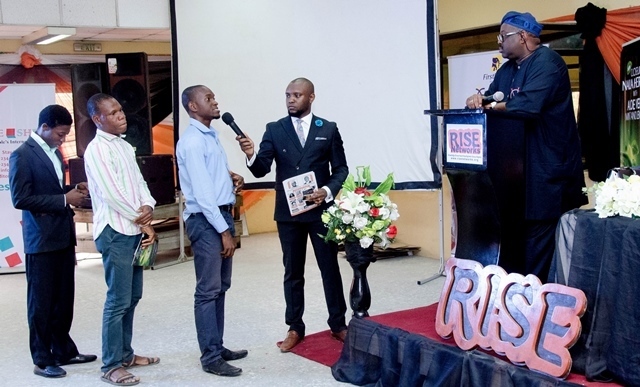 Rise Networks has shown again why they remain the foremost youth platform for empowerment and engagement for Young People across Nigeria as testified to from interactions with many of the Participants. The political space clearly has a space for youths but more youths need to get involved and with the response from the crowd at the event, future politics will be shaped by youths henceforth. 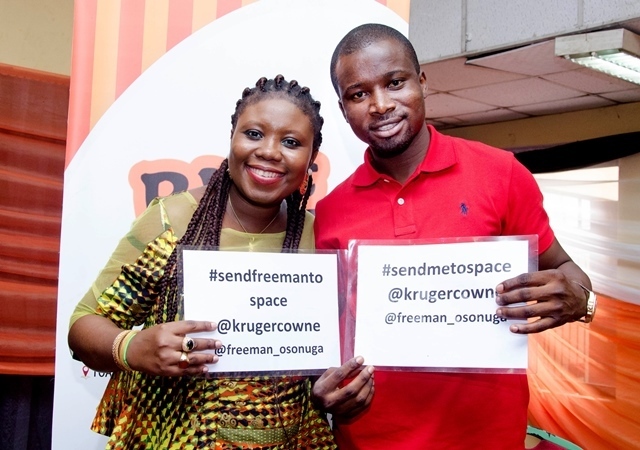 Mrs. Toyosi Akerele-Ogunsiji, Founder/CEO Rise Networks showing support for Ebola Doctor & Humanitarian, Freeman Osonuga in his bid to be the First Black African in Space. 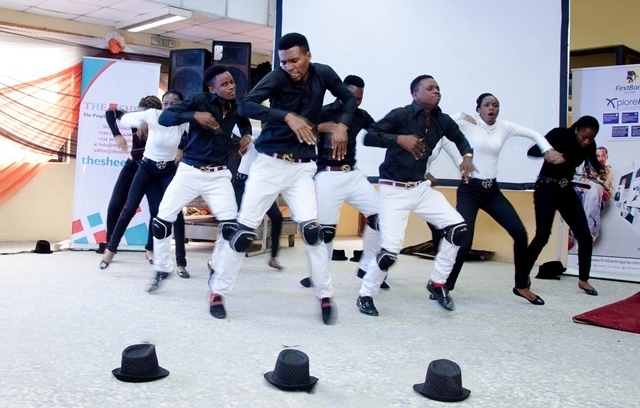 A wonderful performance delivered by the Explicit Dance Group at the #IYD2015NG event. A participant and volunteer sharing a moment on the red carpet at the #IYD2015NG event. 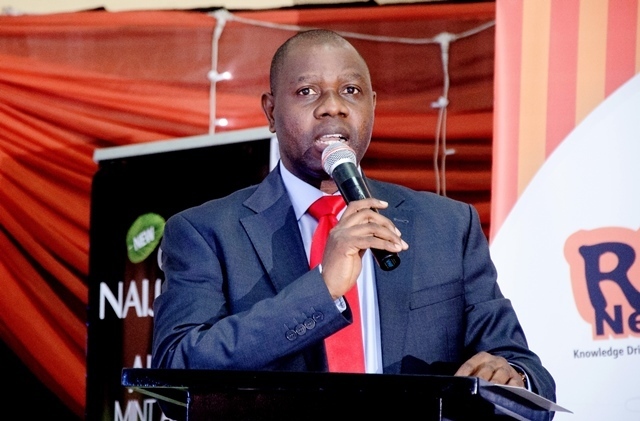 Business Development Executive of Rise Networks, Mr. Bobola Omotuyi delivering the Vote of Thanks at the #IYD2015NG event.